Backyard Bee Hive Blog: Are My Bee Hives Ready for Winter? Are My Bee Hives Ready for Winter? or vice versa. Nothing's going on in the super. One of these top bars is not like the others. I glued in paint stirring sticks to most of them, the premise being to give the bees a low point to festoon and therefore build comb from there. But one top bar has a chamfer glued to it instead, giving them more surface area to begin construction. The Warré bees are going to need our help to make it. Odd for me, I am not torn about whether or not to feed this colony. It wasn't their fault they got put into a box that had two queens. It wasn't their fault their "swarm" was so small. They are getting fed. I hate that I have to take the syrup feeder off — it's attached nice-and-tight with propolis — but these bees will need candy for the Winter. The TBH is inside a greenhouse so nothing needs to be done to keep it dry. For insulating purposes, I've simply piled up a bunch of stuff over the brood end: sheet styrofoam, foilized bubblewrap, a piece of wool felt, an extra migratory roof. Just random things that had no better uses. 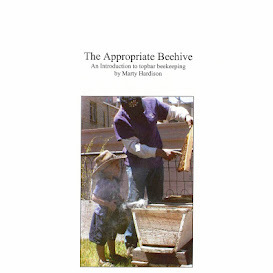 The goal is to prevent condensation from forming above the bees. We're leaving the super in place, to give moisture in the pantry a place to go. The bees won't heat that part of the hive, so if mold's going to grow, that's where it will be. They don't mind cleaning it off, but why make them work harder than they already are?